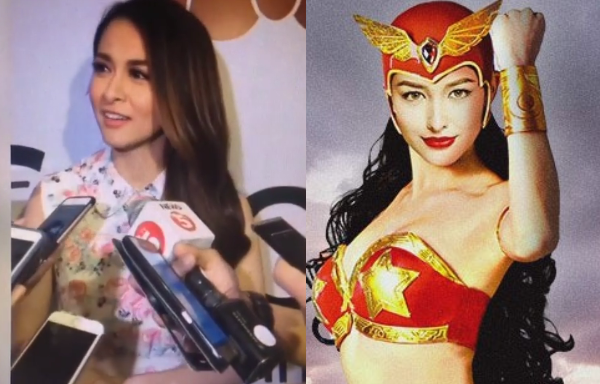 Kapuso actress Marian Rivera has something to say about Liza Soberano's portrayal as 'Darna' in the highly-anticipated movie. The actress, who portrayed the iconic Filipino superheroine in the 2009 teleserye, was asked about her reaction about it during the launch of her newest beauty whitening product endorsement, Snow Crystal White Tomato. Marian said that the Kapamilya actress is a perfect fit for the role. "Oo. Okay naman. Maganda siya. Perfect para sa kanya." she said. When asked for her message to Liza, the actress felt shy considering the fact that they haven't met each other yet. However, she believes that she can pull off the iconic role. "Parang majority naman yata eh, siya yung gusto. ‘Tsaka ganda naman tapos ang seksi. Kaya niya ‘yan!" she stressed.